Intel dumped $300 million into the laptop industry to buy it something it's never had before: attention. Ultrabooks sound cool, and could look beautiful while running like little thin crust pizzas of awesome. Instead, we're seeing pathetic MacBook Air clones. What went wrong? From the floor of Intel's Developer Forum, its yearly showcase of new silicon and what it's going in, it's clear Apple's capable of a two front intellectual property war, if they choose. Cupertino thinks its designs are under attack! And they are—but they're looking in the wrong direction. Samsung's phones and tablets might share Apple's black rectangle minimalism, but the crop of black-on-silver Ultrabooks littering the floors of IDF are the real ripoff—like a heap of fake Gucci bags off eBay. Absolutely zero effort has been put into their design, beyond the labor of opening a tab of store.apple.com. If someone replaced my own Air with one of these shams I think it'd actually take me a second to realize the switch. That is, until I realized they were counterfeits, not replicas. And it certainly wouldn't be the first time. This is only the latest wave amid years of Apple design dupe frenzy. 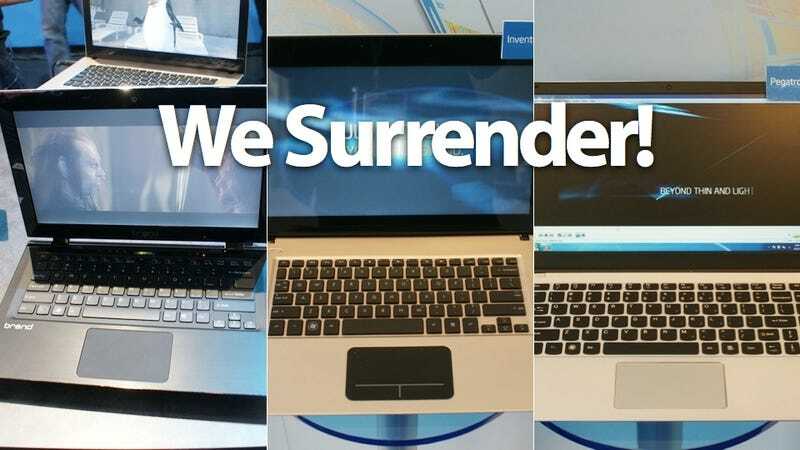 If Ultrabooks are going to take off—and we hope they do, and they certainly should—they're going to need to become desired objects by virtue of their own desirability. They need to stand on their own. Hijacking Apple's design department is only going to make them look like second place losers—which at this point, they already sort of are. Independent thought, independent design, and the courage to actually compete against Apple instead of bowing to it and nibbling its aluminum unibody toes will put Ultrabooks in the public eye. I don't care about Apple's intellectual property. Let lawyers squirm in their undies about that. What I want is a wide choice of awesomely slim laptops for everyone—OS X or Windows fans alike. Samsung's proven that yes, you can indeed make a gorgeous laptop that actually outdoes Apple's anorexic chassis in some ways, all without breastfeeding from Jonny Ive's aesthetic mammary. Lenovo and Sony have also gone their own way, and done it well. Ultrabooks mark the first time I can remember myself caring about a PC laptop for any good reason. Intel's heaped money into the project, practically begging companies to succeed. And they have a chance! These computers have terrific components, the luxury of extreme thinness and lightness, and could be paired with the phenomenal (looking) Windows 8—all in all, a super exciting bundle. But the manufacturers behind them are going to have to rustle up some ambition, some faint desire to be different from Apple. Anything else is surrender.